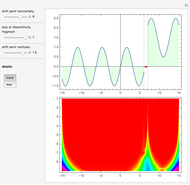 The continuous wavelet transform decomposes a signal into a series of time-varying coefficients. 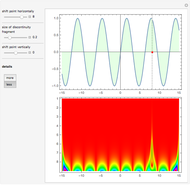 The wavelet scalogram plots the magnitude of these coefficients by representing each coefficient as a single row. The scalogram is a time-varying spectral representation of the signal. 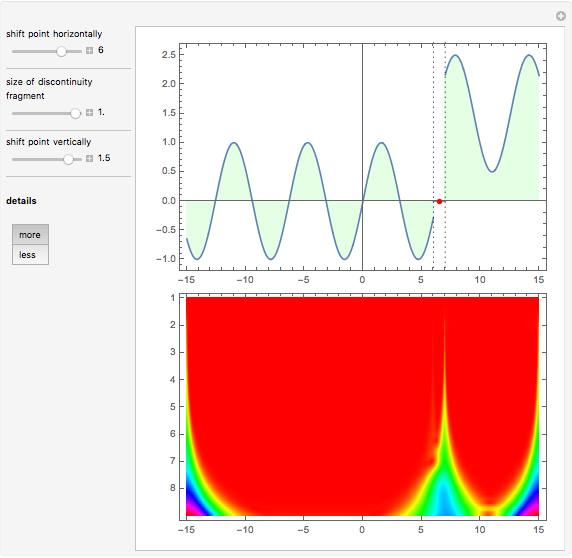 In the upper plot, a removable (point) and jump discontinuity for the sine function is shown. 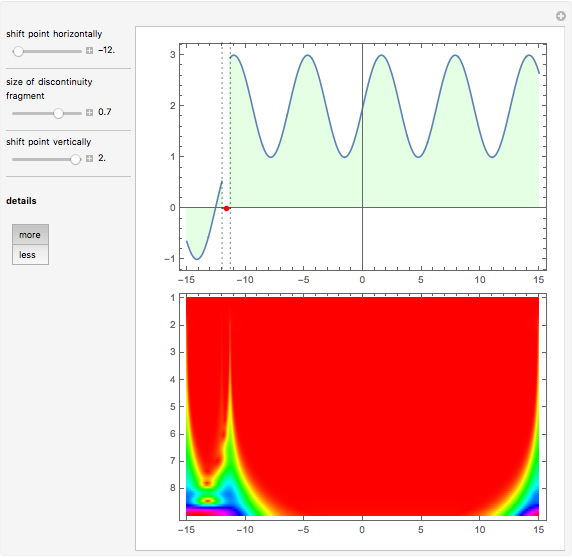 In the lower plot, the wavelet scalogram is shown. The lower-order coefficients give information about the high frequency components in the signal and are therefore able to capture the presence of any abrupt changes in the signal. 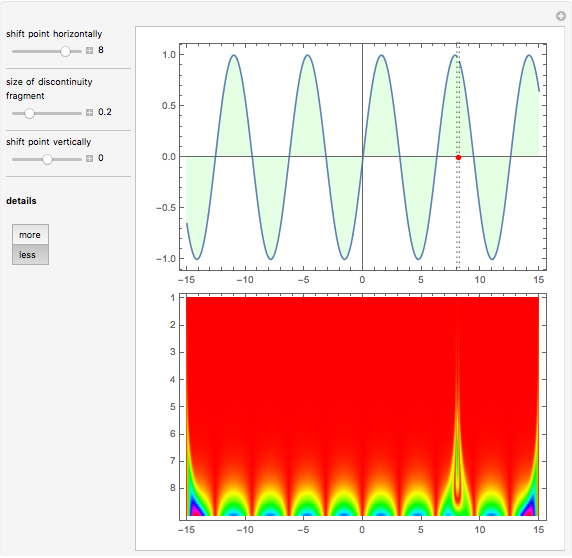 The location of discontinuities in signals can therefore be captured well using wavelet analysis, as shown in the wavelet scalogram. Wavelet transforms are excellent for identifying local discontinuities. Detection of discontinuities is valuable in signal and image processing, physics, geophysics, economics, and medicine. M. Bozzini, F. De Tisi, and M. Rossini, "Irregularity Detection from Noisy Data with Wavelets," Wavelets, Images, and Surface Fitting, Wellesley, MA: A. K. Peters, 1994 pp. 59–66. J. Canny, "A Computational Approach to Edge Detection," IEEE Transaction on Pattern Analysis and Machine Intelligence, 1986, pp. 8679–698. D. Lee, "Coping with Discontinuities in Computer Vision: Their Detection, Classification and Measurement," IEEE Transaction on Pattern Analysis and Machine Intelligence, 12, 1990 pp. 321–344. T. Gutzmer and A. Iske, "Detection of Discontinuities in Scattered Data Approximation," Numerical Algorithms, 16, 1997 pp. 155–170. S. Mallat and W. L. Hwang, "Singularity Detection and Processing with Wavelets," IEEE Transactions on Information Theory, 38(2), 1992 pp. 617–639. Olexandr Eugene Prokopchenko, Ukraine "Detecting a Discontinuity Using a Wavelet Scalogram"